It’s not hard to tell that Austin Whitt, Gianella Cisneros, Merrill Crawford, Logan Whitt, Allison Cormier, Rocio and Clay Moore, from left, are having a great time at the Assistance League gala at the Golfcrest Country Club in Pearland. 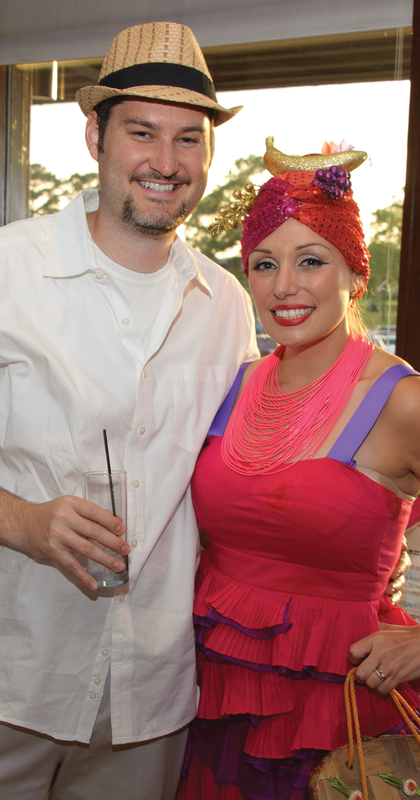 Hillary and Paul Gramm are ready to party at the Assistance League’s Night in Old Havana Gala. 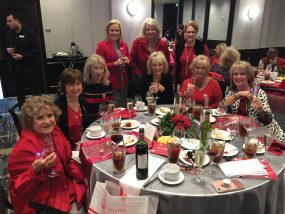 The annual gala, chaired this spring by Carol Latimer, Vicki Tallman, Pam Bungo, Katy Bastedo and Yvonne Perrin, is ALBA’s big fundraiser of the year and one of the Bay Area’s big fun nights of the year. Besides all the partying and dancing, led by President Peggy Clause and her husband, Jerry, several awards were presented and Clear Creek ISD Superintendent Greg Smith, who came with his wife, Kathy, told the crowd about the importance of ALBA to the Clear Creek School District. Jill Williams presented the Hope Award to Cindy and Slade Lewis of Lewis Jewelers while Vice President Sarah Foulds and Operation School Bell Chairman Cindy Senger Lewis presented the National Operation School Bell Award to the Kemah Lions Club, which was represented by President Tom LaSanta, Past President Bill Kerber and Secretary Elma Garcia. Proceeds from the event help fund Operation School Bell, Operation Cinderella and ALBA’s many other community outreach programs to improve the quality of life for at-risk populations. Ch. 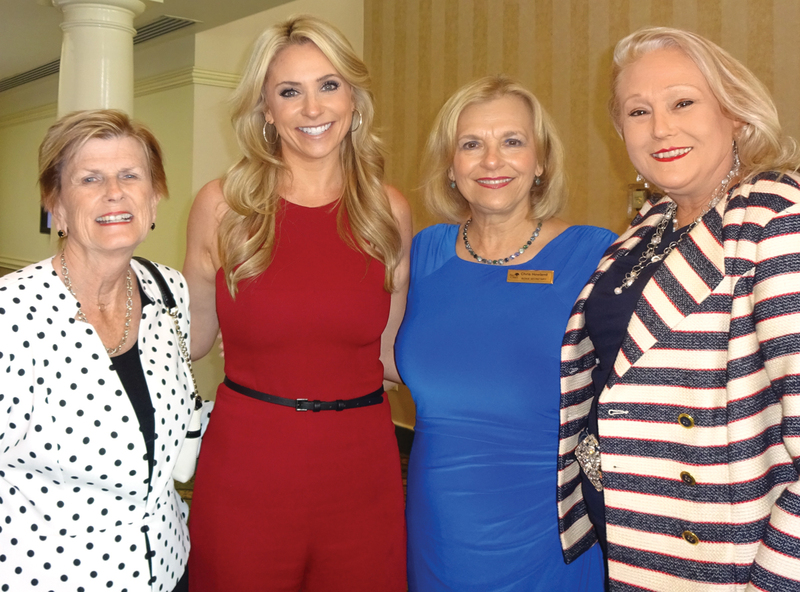 11’s Chita Johnson, second from left, gets a warm welcome from Jennie Hampton, Chris Howland and her grandmother-in-law, Annette Snow Falks, from left, as she arrives to address the Bay Oaks Women’s Association luncheon at the country club. CHITA JOHNSON was quite a hit when she presented the program for the Bay Oaks Women’s Association April luncheon at the country club. The Ch. 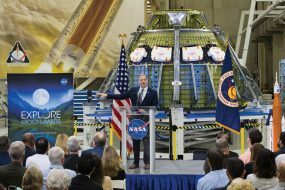 11 weather prognosticator, who came to Houston from California in 2011, talked about her growing up years, schooling and how she became a meteorologist. Many were probably surprised to learn she is an avid traveler, has been skydiving over the Swiss Alps, river rafting down the Ocoee River in Tennessee and rock climbing in California’s Hume Lake. Some of those assisting President Jodi Schnabel and Vice Presidents Karen Reed and Cynthia Villereal with arrangements included Hospitality Committee members Terri Steinkamp, Emmeline Dodd, Sharon Christman and Janet Greenwood and those on the Registration Committee – Ruth Beecher, Glenna Crist, Eileen Hult, Carlene Langford, Sharon Phelps and Lucille Terraso. Win Weber, a Clear Creek School Board trustee, shows off a casual outfit at the style show. 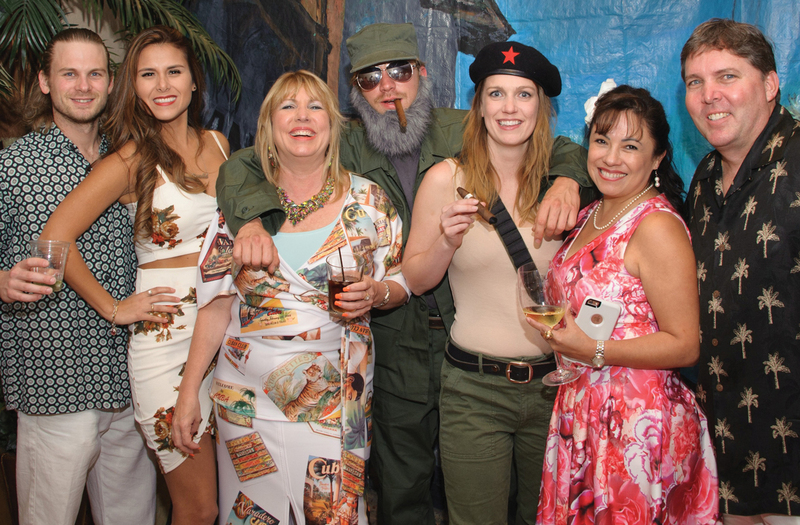 “EVERYTHING OLD Is New Again” is the theme Nassau Bay Garden Club used for its big style show luncheon April 1 at Lakewood Yacht Club – celebrating its 52nd year as a garden club with fabulous fashions and fundraising auctions. President Nancee Lynn and Ann Gay chaired the event – a celebration of spring and support for the club that provides so much for the Nassau Bay community — while Jenni Hudgins and Valerie Moses were in charge of the style show. Models Joy Edwards, Tuie Lee, Sandra Mossman, Diana Denman, Ashleigh Klug, Mary Chambers, Pam Phillips, D’Lisa Johnston, Christie Reynolds, Kathryn Gehbauer, Kelly Halbach, Jayne Samson, Win Weber, Stacy Amdur, Holly Williamson, Sue Warters, Becky Smith and Alice Johnson wowed the crowd of 225 as they came down the runway showing off the latest in fashion and accessories from Back Bay Boutique, The Clotheshorse, Casanova’s Downfall and Lewis Jewelers. 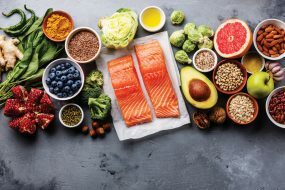 Proceeds will provide scholarships to students in horticulture and agriculture and used by club members for the upkeep of six different gardens in Nassau Bay, the Blue Star Memorial on NASA Parkway and for trees planted on Arbor Day. Others assisting with arrangements for the event included Cherry Nims, Jayne Samson, Ann Davidson, Mary Tuttle, D’Lisa Johnson, Sue Warters, Peggy Hill, Gail Ferris Beasley, Suzanne Gossett, Mary Ann Prescott, Betty Armstrong, Lin Warrington and Joyce Mayor. Dogs & Diva model and her companion come down the runway. Photo by Mary Alys Cherry. 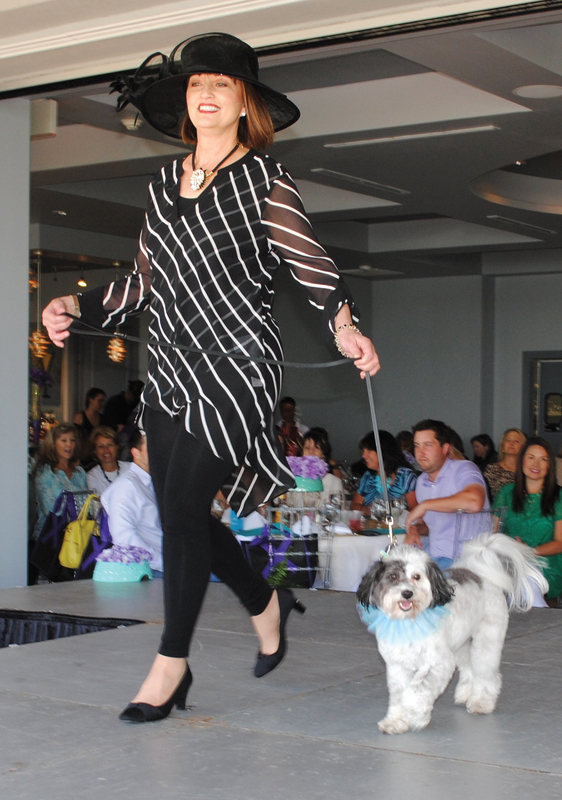 POOCHES ALWAYS liven up our lives, and they did once again when Bay Area Turning Point hosted the Dogs & Divas Fashion Show Luncheon at Water’s Edge on NASA Parkway. Most performed remarkably well – even if we did occasionally hold our breath. El Lago Mayor Robby White was among the models, as was Lakeview Police Chief Tom Savage and El Lago City Secretary Ann Vernon. Others included Kerri Taylor, Vee Hernandez, Skylar Darr, Kathy Wagner, Lee Swindler, Stacy Brown, Jerica McClain, Ashton Bailey, Sybil Winters Little, K.C. Chipwadia, Hector Ruvalcaba, Marcia Turner, Taylor Buikema, Shirley Terry Lopez and Lea Bodie and their cute companions, showing off fashions from The Clotheshorse, Melinda’s Boutique, Casanova’s Downfall, Joseph A. Bank, Alvin Tuxedo and Impression Bridal.